Gone to See Europe 2014. Day 23: Semester at Sea, Summer 2014 Semester Voyage. Lisbon, Portugal. Morning Storm Clouds on the Tagus River in Lisbon, Portugal from the Deck of the MV Explorer. Composite of 17 images taken with a Leica X2 camera (ISO 100, 24 mm, f/4.5, 1/60 sec). AutoPano Giga Pro, Silver Efex Pro. This storm caused more individual incidents of damage to PSE&G’s electric infrastructure than Hurricane Irene. numerous trees and power lines. Other than a few power dips (brown outs), the power remained on for the last day. My APC UPS units continue to protect the computers and servers. The following is an update from PSE&G. Saturday’s wet, heavy snow that brought down numerous trees and power lines. Crews will continue to work around the clock until all customers have power. number of service lines that are damaged as a result of falling tree limbs. serving the largest number of customers. Halloween and a 2 Year Anniversary. I finally got power back here at my house in New Jersey after a very early snowstorm. Two years ago today I was in Florida for a wedding of Lars (my brother) and Valerie. 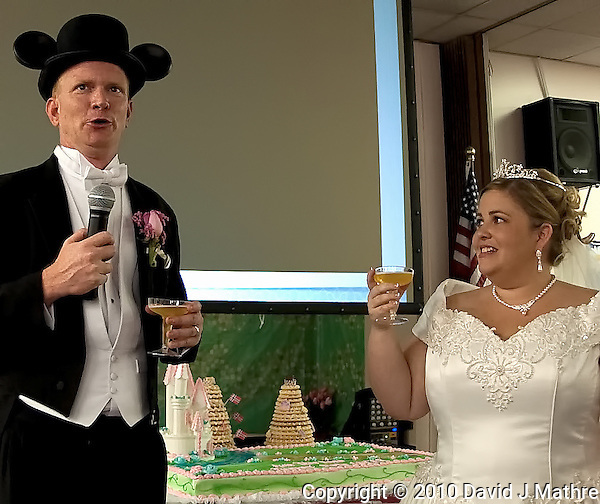 I’ve made it clear in the past that I do not do, and am not a wedding photographer. On the other hand this did not stop me from taking some pictures that day. For a full selection of images from that day please check out 31-October-2009. The power came back on at about 3:30 AM, which was good since the house was getting cold. I had moved out to the RV since it has a propane heater. Unfortunately, the power went out again at 10 AM. Once it was light out, I went out to survey the damage. Several more trees down, including my favorite Japanese Maple in the front yard. The remaining Birch trees were bent almost to the ground. Images to follow. The night before Halloween is known as “Mischief Night” in this region. Hope folks are not running around tonight with downed power lines. Right now PSE&G is saying power should be restored by midnight Halloween, or for some of the worst hit parts of the state on Wednesday. If it is going to be much longer, I will need to drain the water in the pipes before they freeze.